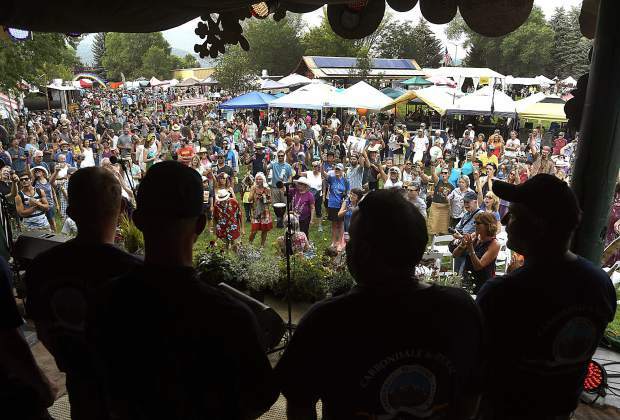 Members of the Carbondale and Rural Fire District receive a standing ovation as a community toast is given in their honor on opening night of the Mountain Fair Friday in Carbondale. The Rhythm of the Heart Community Drum Circle, opening night of the Carbondale Mountain Fair. Emma Kelleher of Breckenridge demonstrates acutonics on a group of visitors to the Carbondale Mountain Fair Friday. Austin Anderson of Fremont, Utah carves a wooden spatula Friday at the Mountain Fair. Former Mountain Fair director for many years, Thomas Lawley, receives a warm welcome during the opening blessing Friday at the Mountain Fair in Carbondale, as current Fair Director Amy Kimberly adjusts his mic. 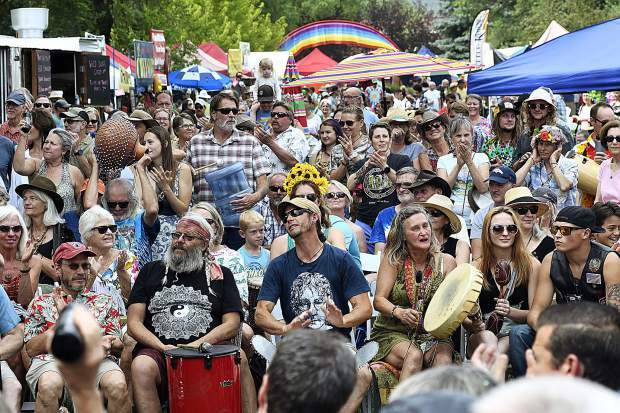 The silence didn’t last long after the final drum fell silent into the cool early evening air Friday during the opening of the 47th annual Carbondale Mountain Fair. 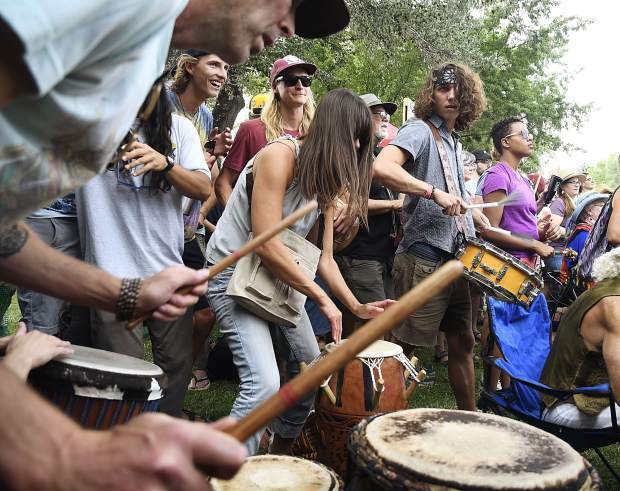 It only took a few minutes, but the crowd shuffled closely together in front of the Gazebo, as a half-a-dozen firefighters and emergency medical technicians took the stage at Sopris Park to a standing ovation. The crowd showed its love and respect to the Carbondale and Rural Fire Protection District, who were among the first responders when the Lake Christine Fire broke out earlier this month. 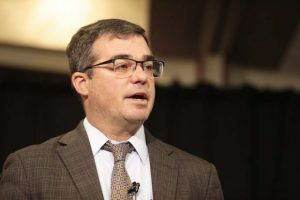 “It’s one example how hard they work and what they are willing to risk to protect the community,” Carbondale resident Brandon Jones said. Only a few words needed to be spoken to show the love the people gathered at the park felt toward the men and women of the fire department. With the raising of a couple hundred hands, the town’s people saluted their service with a toast and applause. “Its very humbling to see the town behind us during a tough first season,” Carbondale firefighter Keegan Fawley said. As the firefighters gathered behind the stage after the toast, one by one people greeted and thanked them for their efforts during the Lake Christine Fire. “Makes us realize why we are here,” said Carbondale firefighter Garrett Kennedy after seeing the amount of people there to honor him and his coworkers. 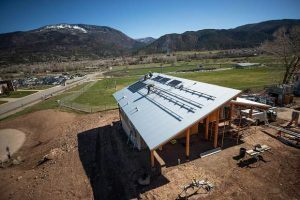 The toast was one of several moments of the opening day of the Mountain Fair that revealed how close the small Roaring Fork Valley community is. 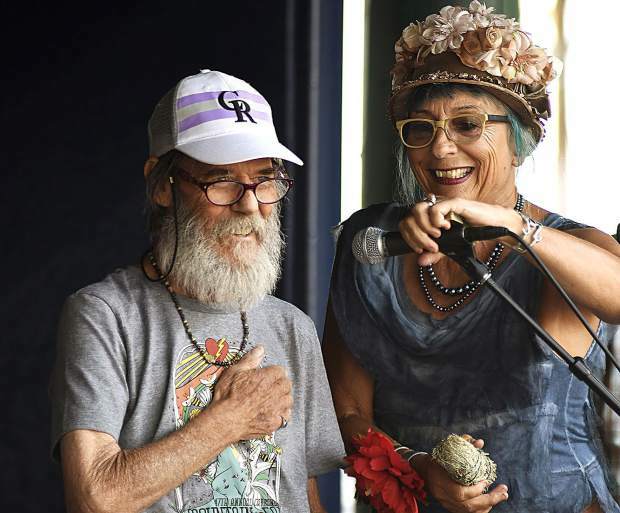 This year’s opening blessing, given by longtime former Mountain Fair director Thomas Lawley, started the love, which continued with member after member of the community sharing memories of Fred Haberlein. Since the late 1980s, Haberlein had given the traditional opening blessing for the fair. He died earlier this year. Even those who traveled in for the event knew about the togetherness of the town. 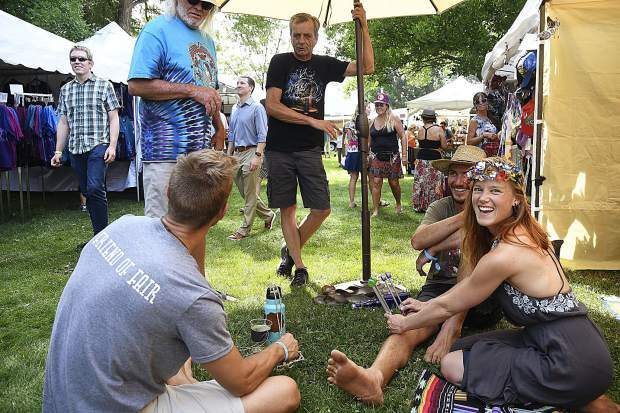 “Awesome, I love it,” said Emma Kelleher of Breckenridge, a first-time visitor and vendor. 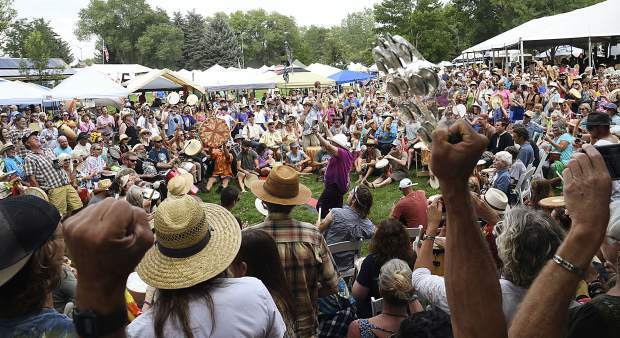 Kelleher is one of the more than 140 artisans at this year’s fair, which runs through Sunday at Carbondale’s Sopris Park. Kelleher is selling handmade crafts and also giving demonstrations of acutonics, which is a relaxing and healing treatment using tuning forks and vibrations. Asked about what she was looking forward to, Kelleher said the opening drum circle. “The whole idea of vibrations, that is special,” she said. The echoes of family and togetherness resounded through the park, as friends and even strangers shared greetings and hugs over serious and whimsical conversation. 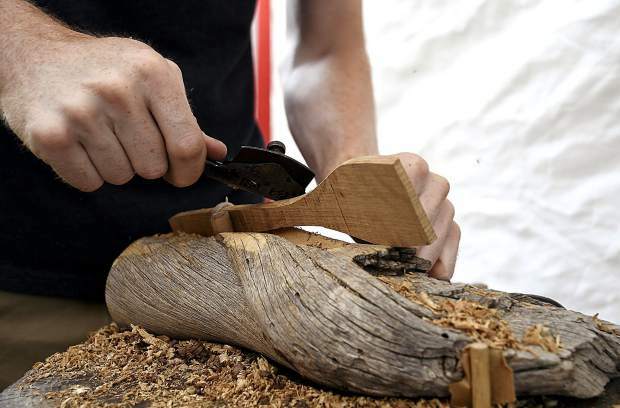 Artisan Austin Anderson of Fremont, Utah, could be seen slowly carving wooden utensils as part of his booth at the fair. The 2018 event is Anderson’s second visit to the fair. “People are really nice here. 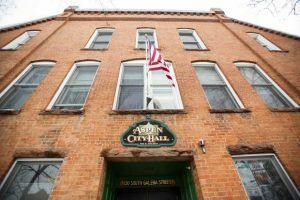 It’s a really tight community,” Anderson said. He said people remembered him from last year, telling him how much they loved his work. 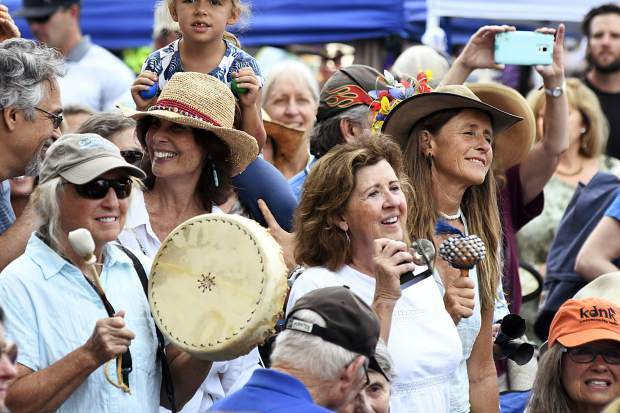 The Mountain Fair continues today with the Mount Sopris Run Off foot race, and the Oasis kids’ carnival opens at 9 a.m.
Other highlights include a fly-casting competition at 10:30 a.m., pie judging, a musical performance by the Cody Jeffries Trio at 11 a.m., The Habits at 12:30 p.m., and more. Popular annual events like the limbo contest and the women’s wood splitting will fill the park with activity this afternoon. The evening’s music lineup includes funk band Down North at 7:30 p.m., followed by the Dance of the Sacred Fire performance after dark.